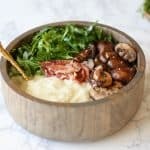 These Mashed Cauliflower Breakfast Bowls are perfect for anyone looking for a Whole30, low carb, or AIP breakfast recipe. While it’s definitely a healthy AIP and gluten free recipe, it also has tons of flavor. The recipe is low carb, AIP & Whole 30 friendly, dairy free, and high in antioxidants. I tend to get stuck in a rut with my breakfasts. When I’m not drinking Butter Coffee for an intermittent fasting focused breakfast, I’m all about the breakfast bowl. Either that, orrrrr I’m indulging with a stack of Matcha Waffles. My schedule most recently is much more leisurely in the mornings than it use to be. I use to be a go-go-go girl, scheduling workouts at 6 am, getting ready in the office or gym bathroom, and running to Whole Foods for a grab and go breakfast. These days, I’m much more chill. I sleep until about 6:45 am, pack James a lunch, and then I get ready to go into the office at the pace of a snail. I don’t go into the office until 9 am now, and despite the extra time I have in the morning, I feel like I’m always rushing at the end. I’ve been pushing breakfast to the last minute, which means, sometimes it happens and sometimes it doesn’t. That all changed when I discovered this breakfast bowl combo. Gone are the days of cold brew and coconut milk for breakfast. 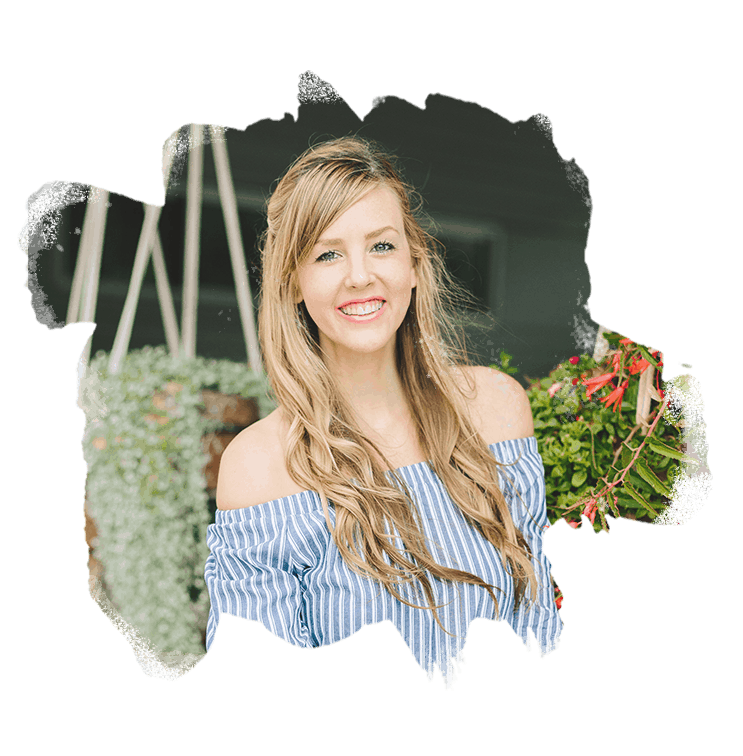 I’m a health coach… I know better than that. 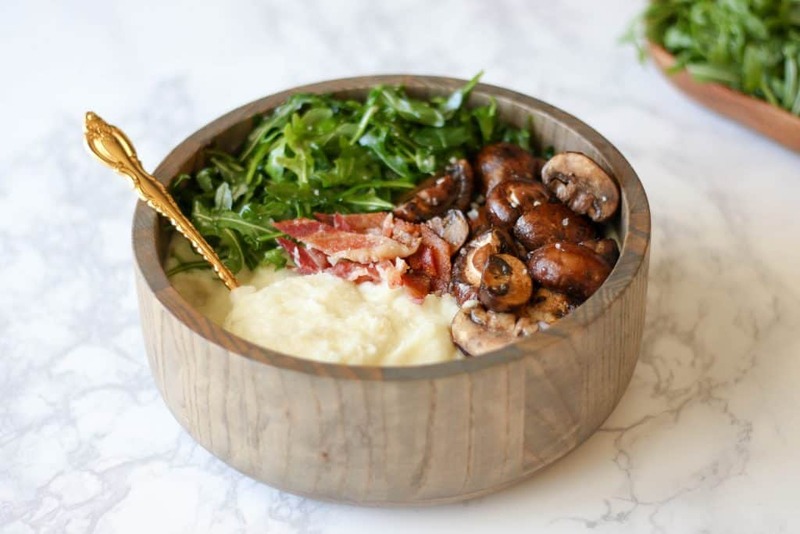 Here’s why this Mashed Cauliflower Breakfast Bowl is perfect for craz-o people like me. Okay, okay. If you’re thinking mashed cauliflower isn’t like mashed potatoes, I feel you. Trust me, I use to feel the same way. Most of the mashed cauliflower recipes I tried had a different texture, a different flavor, and even a different consistency. Then several months ago, by the grace of god, I figured out the recipe that allows mashed cauliflower to be a true contender with mashed potatoes. If you’re a mashed cauliflower naysayer, do me a solid. Try my recipe for Ranch Mashed Cauliflower and report back. Confession: I’m not a fan of mushrooms. It must be a texture thing. Mushrooms are dry, pillowy, and in a way, they’re kind of crumbly. However, mushrooms do have nutritional merit, thus they have a place in my diet. Well, I’ve recently discovered there is a way to not only make them palatable, but also a way to eliminate the three negatives characteristics I mentioned earlier. The trick is simply to sauté them with fat (I like to reserve the grease from bacon for this) and liquid. If you take it a step further and make that liquid be Coconut Aminos… well, these mushrooms have just landed themselves a place on my “favorite foods” list. The former vegan in me is in a corner pouting, but I truly feel like crispy bacon is just one of those foods I’ll always love and always have loved. Although I do have a favorite cooking method, it really doesn’t matter how it’s cooked. I’ll think it’s delicious regardless. So long as the bacon is sourced from a trusted farmer (high quality is so important when eating pork), I’m down with eating it. Check out the recipe to see my favorite cooking method. Finally, we get to the greens. It’s important for detoxification and disease prevention to get as many antioxidants from vegetables as possible, so whether you choose to include arugula or another leafy green, I highly encourage including 1-2 servings in this dish. When I was younger, arugula and I did not get along. Years later, my tastebuds have grown up, and suddenly I love it. Go figure. Heat oil in a sauté pan over medium low heat. Slice mushrooms in half and add to sauté pan. Cook slowly over low heat for the flavors to fully develop. 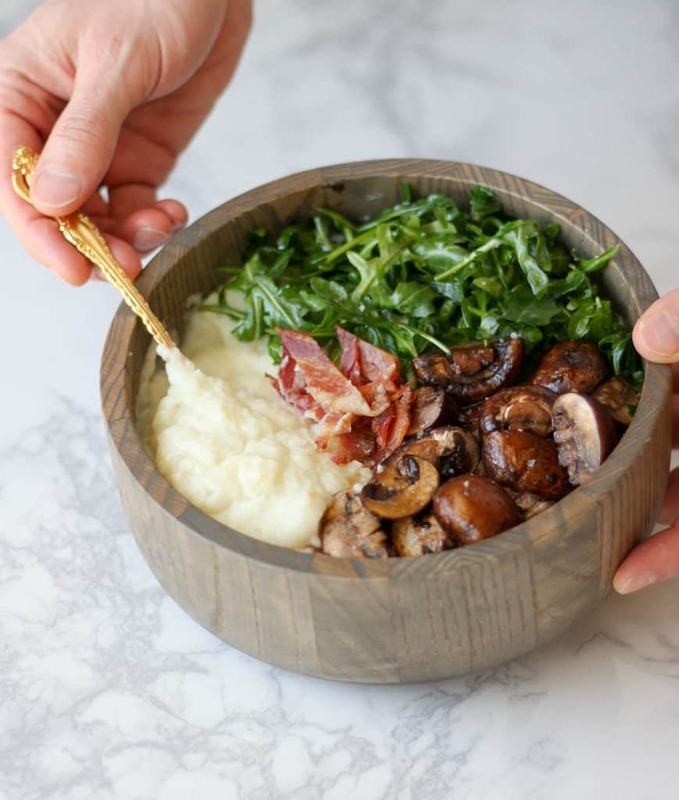 When the mushrooms are well cooked, pour in the Coconut Aminos to deglaze the pan and develop a caramelization on the outside of the mushrooms. Remove from heat and sprinkle with a bit of coarse sea salt while the glaze is still wet. Lay bacon on a rimmed, parchment lined baking sheet. Cook until crisp, about 12-15 minutes. Remove bacon from cooking sheet and set aside to cool on a paper towel. This will absorb extra grease. Reserve the grease left on the baking sheet and store in an airtight jar in the fridge to use for cooking. Once bacon has cooled, rough chop and store until use. Divide ingredients along with 1/2 a batch of my Ranch Mashed Cauliflower among 2 bowls, and drizzle with olive or avocado oil. Sprinkle with coarse sea salt. These ingredients can be prepped the day before and reheated for a quick breakfast bowl, or eaten straight from the fridge. Can’t wait to try making this, it looks so good. Beautiful photos by the way! Just made this today, it was so good! Very flavorful and filling for such a healthy recipe. Using the bacon rendering for cooking the mushrooms made them so delicious. Thank you for sharing this recipe. I’m so glad you liked it! Thanks for trying, and for the feedback! When does the arugula come into this recipe? How much yeast do you use? I’ve never used nutritional yeast. I haven’t started a strict paleo diet yet, so I’m new to most of this stuff. However, I have tried “mashed cauliflower” in the past and it was horrible!!! So as per your request, I’ll give this a try. What is the nutrition info on this receipt? Like calories, carbs, and protein? Honestly I’m not sure as I don’t track macronutrient ratios myself. If you ever insert the recipe into a calculator, you’re welcome to come back here and share the details with us. I’d really appreciate it! So glad to find you and this recipe! Looks aMAzing! My mouth is watering right now. Thanks so much, I hope you love it! Oh yeah, I have discovered the combo of shrooms and coconut aminos. Wow! Can’t wait to try your mashed cauli technique! Hope you love it, Becky! First off, kudos for the “yo” in the ‘about me’ sidebar. Those sections are always so generic and boring. Second off, it looks and sounds amazing. I am totally making this (subbing crisp salmons skin for the bacon)! Barry, you’re awesome for reading my sidebar bio! And double awesome for using salmon skin in place of bacon. HOW HAVE I NEVER THOUGHT OF THAT?! 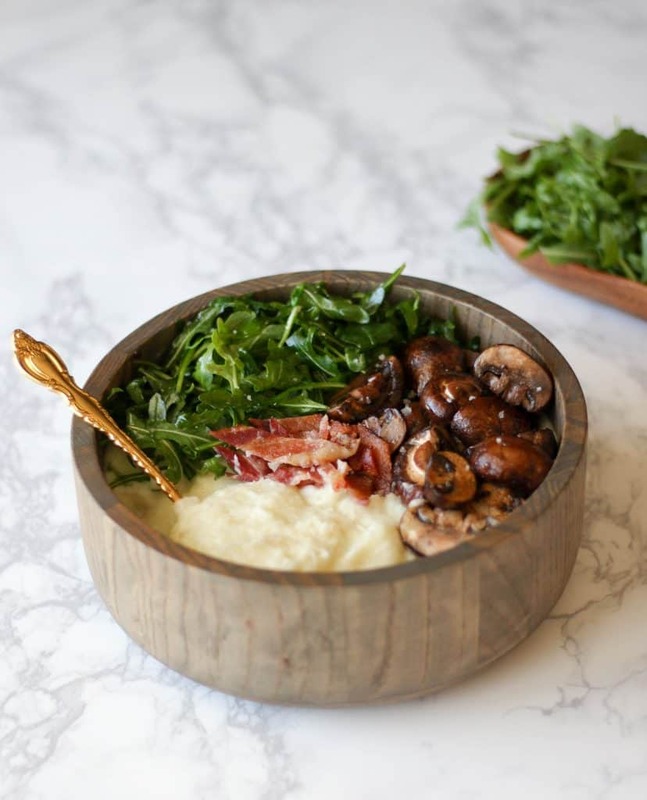 I love the wooden bowl! Do you remember where you bought it? Thanks! Hello! This looks delicious but I’m curious about the use of bacon. I found your recipe after following a link for anti inflammatory meal plans. Bacon is inflammatory, so why do you use it? Yes, bacon is a pro-inflammatory protein, but I personally tolerate it well. I also find it to be a quicker protein to make when I need a quick breakfast – compared to forming ground meat into patties. If you’re sensitive to bacon, I recommend using the sliders from this recipe in its place. Enjoy! I absolutely LOVE this!!! I have never tried it with arugula because I’ve never have it at the time I made it. I have used spinach or broccolini that with briefly tossed with with the mushrooms as I deglazed the pan. I tried the mashed cauliflower to make it and now I almost always have cauliflower on hand. 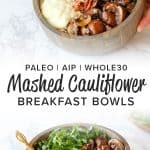 The breakfast bowls and the mashed cauliflower are two things that have made my transition to AIP every comfortable. Reading this made my day! Thank you so much for letting me know you enjoyed them! I thought this would be a basic, plain Jane, quick, easy-recipe. I’m so glad I was wrong. It was positively sinful! The mashed cauliflower was wonderful and I really don’t like dupe dishes! The key is the gelatin. Do not omit it! I topped ours with Pickled Dandelion Buds (think Capers), A splash of Artsian Balsamic Vinegar, Beet Green Pesto (no cheese) and Coconut Oil. It was a decadent meal. Thank you for a wonderful recipe I’m looking forward to eating this for years to come! This whole recipe us divine but the addition of gelatin to the cauliflower mash is absolutely genius. It was so delicious and decadent! This recipe will be a major staple for me from now on. Thank you so much! This recipe is so delicious and satisfying that I had to include it in a round-up of my favorite gluten-free breakfast recipes! Thanks for creating such an amazingly simple yet scrumptious breakfast! !